A newly-issued report from the U.S. Immigration and Customs Enforcement agency is meant to name and shame local police and sheriff's departments that don't cooperate with the feds by holding immigrants in local jails for extra time so they can be taken into ICE custody to face immigration charges. The report was requested by President Trump through an executive order as part of a White House campaign to "better inform the public regarding the public safety threats associated with sanctuary jurisdictions." But the report — which was issued without giving local law enforcement agencies an opportunity to provide feedback, or to even review ICE's data — appears to contain inaccuracies. The Alameda County Sheriff's Office was one of the local agencies named in the report as having declined a detainer from ICE. 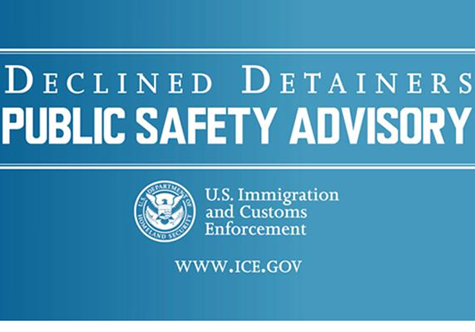 Detainers are requests sent by ICE to local police agencies asking that they hold a person in jail for extra time, beyond what's legally allowable based on the criminal charges the person faces. The purpose of the hold is so that ICE can take the individual directly into custody to face immigration charges. Many so-called sanctuary jurisdictions do not honor detainers from ICE because they're not required to under federal law. Courts have also ruled that detainers violate people's constitutional rights. Furthermore, in California, the Trust Act bars sheriffs and police from carrying out a detainer request in most cases. 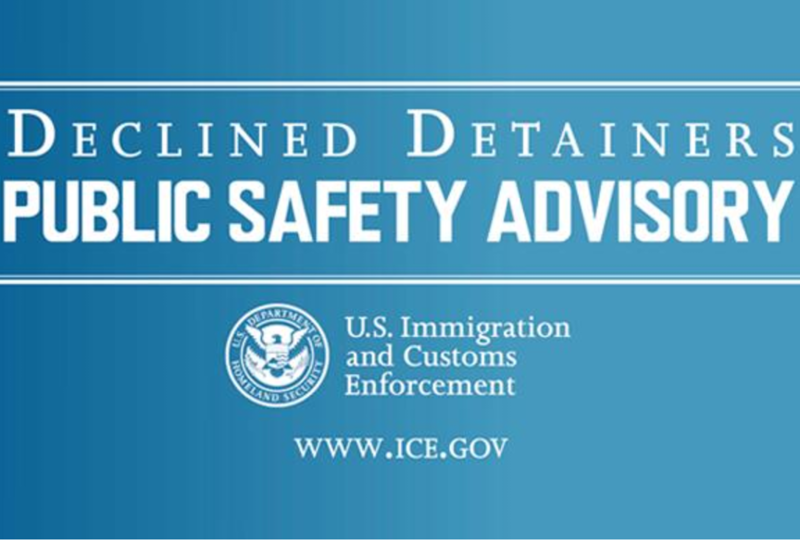 According to ICE's report, the Alameda sheriff's Santa Rita Jail declined an ICE detainer issued in January against a Cambodian citizen who was convicted of a domestic violence charge. The Alameda County Sheriff disputes this claim, however. "Just to make sure we're doing our job right, we looked into ICE's detainer list, but we could not find the specific case that corresponded in our records with what ICE listed," said Sgt. Ray Kelly of the Alameda County Sheriff's Office. "When we contacted ICE to do a follow-up, they were unable to provide us with the name of the person, and nothing matching that date and time was in our records." Kelly said his agency initially looked into the specific case highlighted by ICE to ensure the county jails are operating properly under state and federal laws. Other local law enforcement agencies in California also told the Express that the ICE report appears to contain inaccuracies, and that they haven't been able to get more information from the feds. For example, ICE claimed that the Anaheim Police Department released a Mexican citizen despite a detainer request made on January 18. The ICE report listed a charge of burglary as "notable criminal activity" the man was allegedly engaged in. "What’s listed for us, apparently, is an issue from April 18, involving a man who had a burglary charge," said Sgt. Daron Wyatt of the Anaheim police. But Wyatt said his department doesn't have any corresponding records for a person fitting this description from that date. Instead, Wyatt said his department was able to identify a man arrested the day before who roughly fits the description, but the man wasn't charged with burglary. Rather, he was arrested and charged for drug possession. There were also warrants for his arrest on drug charges and for possessing burglary tools. Wyatt said the charges were all misdemeanors. He also said his department wasn't contacted by ICE before the report was released. And he added that state law forbids the Anaheim police from honoring an immigration detainer against a man like the one the report appears to have singled out. "We’re bound by the Trust Act that says when we can and can’t honor these. If we’re mandated to honor a detainer, we will," said Wyatt. The Express also contacted the Los Angeles County Sheriff's Department, which, according to ICE, declined two detainers issued in May and August of last year. One detainer, according to ICE, sought to put a hold on a Mexican citizen who had been convicted of assault. The other was for an El Salvadoran national who was convicted of a domestic violence charge. The specific nature of each case is unexplained in the ICE report, however. Los Angeles County Sheriff's Department Public Information Officer Nicole Nishida said she's been trying to get more information from ICE to check on the two cases, but the agency hasn't responded yet. "We can look at everyone we've released, but these two people are like a needle in a haystack," said Nishida. Los Angeles' jails book over 100,000 people each year and have a daily population of around 16,000, according to department records. "We’re trying to ascertain from ICE who these people are," said Nishida. In Texas, the Travis County Sheriff's Office is openly disputing the numbers of detainers ICE claims it declined. According to ICE, the Travis sheriff declined 142 detainers, but the sheriff says the number was lower — 128. In Washington state, the Snohomish County Sheriff went so far as to call the ICE report "offensive" and "untrue." The Express was unable to reach ICE representatives for comment. But multiple law enforcement sources said that the declined detainer report was issued by ICE's Washington D.C. office, and that it caught local ICE field offices in California by surprise.